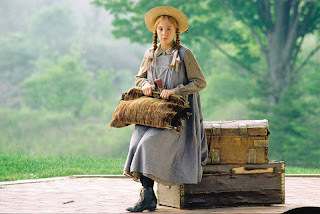 Wicked Wonderful Words: "Anne of Green Gables" - the perfect tween read! I was ten years old when my parents bought me my first "Anne of Green Gables" book by L.M. Montgomery and I wanted it because my best friends older sister was infatuated by Anne. I vividly recall her walking around wearing a red curly wig and daydreaming about fairies. Later that summer I was the one doing the daydreaming and when I reread "Anne of Green Gables" last week, I remembered why. It is impossible, I daresay, not to love Anne. For those of you who have not yet read about Anne and her many scrapes, here is a short summary. Anne Shirley is an 11-year-old orphan who by mistake turns up on the doorstep (almost) at Green Gables, the home of Matthew and Marilla Cuthbert, two elderly siblings. Though they really wanted a boy to help out on the farm they go ahead and adopt the free-thinking, hapless Anne who are accidentprone and who gets herself into a great many embarrassing adventures such as serving wine instead of cordial and dying her red hair green. Anne is basically a good person, she means well in everything she does and it is a pleasure to follow her adventures as she grows from an unloved child into a young, accomplished woman. There are eight more books in the "Anne" series and over the name few weeks you will be able to read about them here. "Anne of Green Gables" is the perfect tween read because it is an utterly comforting book: No you are not to only one to worry about your looks, yes all girls want a bosom friend and yes boys at that age really are a different species. Growing up with Anne was amazing and I will definitely give my goddaughter the books about her as soon as she is old enough to read! I've never gotten around to reading the books though.